The end came for the anti-communist John Birch Society not from foreign enemies but from its own founder. Barry Goldwater was widely known as a man with extreme views. He is still remembered as the man who said, “Extremism in the defense of liberty is no vice.” But even Goldwater thought Robert Welch went too far. Welch founded the John Birch Society in 1958 to oppose what he saw as the growing communist influence in America. Through his publications, he attacked whomever he thought was furthering the interest of the Soviets. He also promoted the idea of impeaching Chief Justice Earl Warren and the withdrawing the U.S. from the United Nations. He named the John Birch Society after an American military advisor in China who had been killed by communist forces. Welch thought Birch would be a suitable model for the anti-communist cause. When Welch started his society, the hunt for communist agents and sympathizers was still going strong. Many politicians and journalists were gaining notoriety for their declarations of enmity to communism everywhere. But none were more committed than Welch, who attacked anyone he suspected of colluding with Soviet Russia. This handbill was circulated by extremists in Dallas, Texas, on November 21, 1963, just one day before President Kennedy visited the city and was assassinated. To many Americans, the society seemed extreme in its black-and-white thinking about patriots and traitors, loyalty and treason. But Welch’s message appealed to others. By 1965, its membership had grown to 95,000. It might have continued growing, too, but Welch didn’t know when to stop. The zealotry of the John Birch Society alienated its potential allies. William F. Buckley, then a rising star in the new conservative movement, denounced Welch and the Society and urged the Republican Party to distance itself from the radical fringe group. 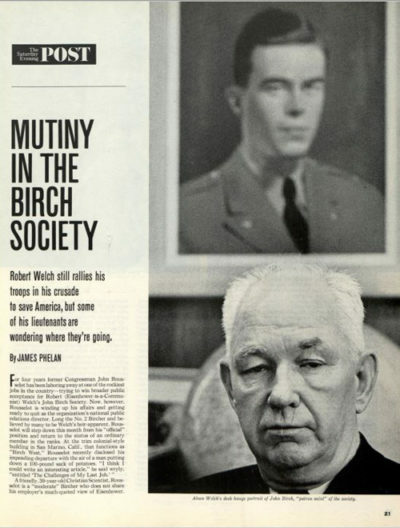 “Mutiny in the Birch Society,” from the April 8, 1967, issue of the Post, portrays Welch, and his organization, in decline. Emboldened by success, he had leveled charges of communism against Chief Justice Earl Warren and the aggressively anti-communist Secretary of State, John Foster Dulles, as well as accusing Defense Secretary Gen. George C. Marshall of being in league with the Soviets. But when Welch accused President Eisenhower of either being a communist or being controlled by them, he went too far. He earned strong disapproval from a country that still liked Ike, and he began losing followers who doubted his judgment. Welch, though, never regretted making the accusations. He worked hard to regain the Society’s momentum, but he was alone. His uncompromising nature had prevented him from forming helpful alliances. Only fringe members of the radical right were willing to associate with him, and these characters were alienating conservatives even more quickly with claims of Jewish conspiracies and that President Kennedy was killed by his Soviet bosses. Another factor contributed to the decline of the John Birch Society: Americans’ attitudes toward communism were changing when this article appeared. Thousands of Americans had died in Vietnam, and thousands more would follow. Many Americans, particularly those of draft age, were starting to wonder whether the great crusade to stop communist expansion was worth it. Read “Mutiny in the Birch Society” by James Phelan, from the Post of April 8, 1967. Multiple factual errors in this article. 1) Goldwater specifically defendded JBS and its alleged extremism 2) The John Birch Society never circulated claims of Jewish conspiracies and in fact has always had Jewish leaders and expelled anti-Semites 3) Far from declining, the JBS is probably at its most influential point ever, even according to many left-wing commentators.